On Monday, the final regular season meeting between the Cleveland Cavaliers and Golden State Warriors was anti-climactic. The Warriors trounced LeBron James & Co., 126-91, to move their record to 34-6 this season. Toward the end of this week, there will be two other marquee match-ups: Rockets/Warriors and Cavaliers/Spurs. Let's take a look at other goings-on around the league. It’s easy to forget about the Los Angeles Clippers. They’re a franchise that’s won just five (yes, five!) playoff series in 46 seasons. And even when it seemed like it had a bright future — for example, when Steve Ballmer bought the club — they’ve managed to screw things up royally. In 2015, they blew a 3-1 series lead to the Rockets in the quarterfinals. And, then, last year, star Blake Griffin torpedoed their season when he got in an altercation with a member of the team’s training staff. This year, Los Angeles got off to a strong start, but had injuries sideline both Griffin and PG Chris Paul. Paul has returned to the court (though sprained his thumb on Monday), and his presence has been instrumental in Los Angeles’ current 7-game win streak. Los Angeles is 6-1 ATS in this stretch, including a blowout win on Monday vs. Oklahoma City. The Clippers will finish their current 5-game home stand with a game on Wednesday vs. Minnesota, before embarking on a 5-game road trip. If Paul can play, then the Clippers will be worth a look on Wednesday vs. the T-Wolves, as .610 (or better) home teams, priced from -4.5 to -11 points, are 122-66 ATS off back to back home wins by more than 11 points. The Utah Jazz (along with the Warriors and Spurs) rank in the Top 3 in defensive efficiency, and play at the league’s slowest pace (91.2 Pace Factor). So, it’s no surprise to find the Utah Jazz playing a preponderance of low-scoring games, of late. Since December 8, the Jazz have gone ‘under’ in 15 of 20 games (though its game on Monday crept over the total of 205, when Utah defeated Phoenix, 106-101, as a 6-point favorite). This week, Quin Snyder’s men will play at Dallas on Friday, before returning home to take on the Pacers on Saturday. I like the Dallas/Utah game to go ‘under’ the total, as Utah’s now gone ‘under’ in 10 straight games, if the line was 198 (or less) points, and Utah was off a pointspread defeat. Anthony Davis left Monday’s game vs. Indiana in the third quarter after he fell hard, underneath the basket. The good news was that the initial x-rays performed on his thumb and tailbone came back ‘negative,’ so his return later this week is possible. New Orleans has covered seven of its last 10 games, and is only 1.5 games out of the final Playoff spot in the Western Conference. This week, New Orleans has two very winnable home games vs. Orlando and Brooklyn. Davis is averaging 29 ppg, and 12 rpg, with a PER of 28.38, so his presence is absolutely necessary for the Pelicans to compete. 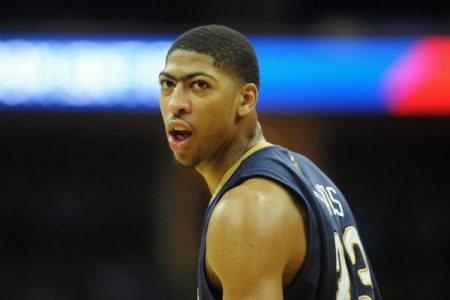 If Davis can play on Wednesday vs. the Magic, then I’ll lay the points with New Orleans. The Magic won, 89-82, in Orlando when these teams met earlier this season, but Davis was held out of that game to recover from a quad injury. This season, NBA teams playing with revenge from a loss earlier in the year, are 79-58 ATS if they lost their most recent game, so that bodes well for New Orleans. The Golden State Warriors don’t lose very often. But when they do, then it’s always worthwhile to play them in the season’s next meeting, as they’re generally well-motivated. On Monday, the Warriors avenged one of their six losses this season when they blew out Cleveland, 126-91. On Friday, they’ll get another shot at revenge when they will travel to the Toyota Center to take on the Rockets, who handed the Warriors a rare home loss in December. The Warriors are a solid 13-1 straight-up and 12-2 ATS their last 14 games when playing with revenge in the regular season against a .400 (or better) foe. And Golden State’s also 13-6 ATS its last 19 games vs. Houston. Don’t miss my One and Only 10* NFL Game of the Year on Sunday. I’m having another winning Playoffs, and I’m 82-51 my last 133 in Football. I’m also red-hot in Hockey (94-54 last 148) and Hoops (306-239 last 545), so join for a week or month today to get all of my award-winning selections.